Make the most of those warm, summer days with a beautiful outdoor entertainment area – somewhere you can eat al fresco, relax in the sun, and spend time outdoors with the ones you love. Whether your garden is large or small, we have some stunning ideas to transform your outside space. Imagine the summer sun warming your skin as you chat with friends or relax with the Sunday papers in your stylish outdoor living room. Create a beautiful, secluded chill-out spot or an opulent relaxation zone with outdoor sofas or a lounge set. Beautiful, comfortable and seriously on trend, rattan sofas are weatherproof and come with removable shower-proof cushions to accommodate our variable British climate. A pair of sofas or a corner sofa will create the perfect entertainment space in your garden. Add a low coffee table (or two) for your caffe latte or your Pimms. Incorporate a daybed into your outdoor living room and you’ll have no more need for those old sun loungers. If you’re pushed for space, try a modular daybed – it’s a versatile option, quickly transforming from an intimate relaxation zone into sociable, comfortable seating for up to eight friends. Alternatively, you could build permanent seating in your garden using upcycled boxing or pallets. Cushions, throws, blankets and rugs will make your outdoor seating feel luxurious and comfortable. Choose water-resistant or fully machine-washable items, so you won’t need to worry about the changeable British weather. Talking of the climate, we’d advise some outdoor heating for when the sun starts to fade and the temperature drops. A fire pit is a safe, attractive way to enjoy living flames in your outdoor entertainment area. Chimineas or fire baskets will also do the trick nicely, while a gas patio heater is a very practical alternative. Not only will outdoor heating keep everyone comfortable, a warm blaze is a sociable focal point that draws people in and creates a magical atmosphere. There’s something very special about eating al fresco. Create a beautiful outdoor dining space and you could enjoy more mealtimes outside. Outdoor dining is easy to achieve with a stylish garden table and chairs. Even the most bijou of gardens has room for a bistro set for two. Give small courtyards a facelift with a painted wall and add a garden mirror to increase the sense of space. Use planters, screens or different flooring to zone off your outdoor dining area from the rest of your garden. Clever planting will not only make your dining area more beautiful, it will also make the space feel more intimate. You want to be able to use your outdoor dining room as much as possible. That’s why providing a little shelter is so important. 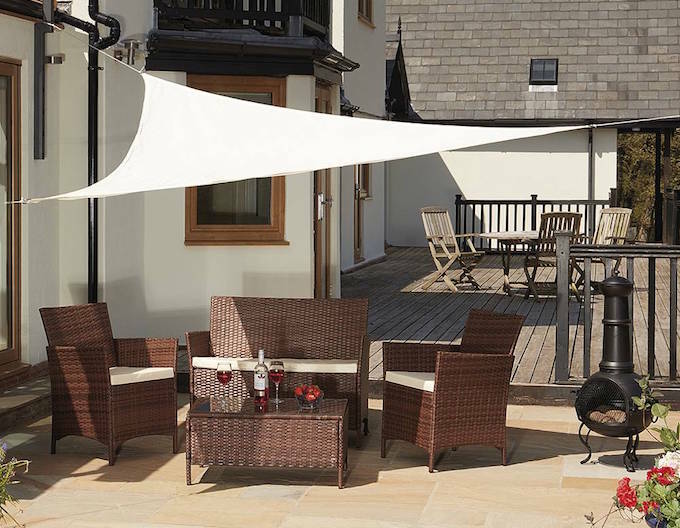 Putting up a versatile shade sail or awning, or installing a more permanent structure – such as a gazebo or summerhouse – will help you enjoy your al fresco dining space whether the sun is blazing or not. Complete the look of your outdoor dining room with some beautiful garden lighting. This will dress the space and allow you to dine, like our Mediterranean neighbours, long into the evening. Suspend strings of solar-powered lights across the dining zone, or hang them in trees. Create ambience with tea-light lanterns and add citronella candles to keep the mozzies at bay. Whether you build your own or go for a pre-made structure, an al fresco kitchen provides the ultimate outdoor entertainment experience. Would a barbecue and workstation suffice? Or do you hanker after a luxury pizza oven/worktop/sink/refrigerator combo? There are plenty of options out there. Zoning is especially important when it comes to the outdoor kitchen. Try to create some space between it and your dining space, otherwise your guests might be ‘smoked out’ by the barbie. On the other hand, you want your kitchen space to still feel sociable. Consider installing some barstools so that friends can stop by for a chat while you cook up a storm. For sociable, party people, an outdoor bar is a garden essential. Whether you choose to incorporate it into your kitchen area, or create a stand-alone bar area, think about the kind of parties you want to host. Consider a dedicated structure like a summerhouse if you want to entertain all year round. And if you want to really splash out, invest in a hot tub. We understand. You’ve read this post and now have plenty of ideas for future outdoor entertainment projects, but... Trouble is, you’ve got twenty people coming over on Sunday and you need the ultimate entertainment area right now! Don’t worry, here are some quick fixes to help you pull off a fabulous outdoor party straight away. Temporarily move your indoor furniture outdoors. You’ll create a wonderful party scene with a full dining table and chairs or a sofa hijacked for the party. Just be gentle with your back and remember to return it all before nightfall. A more practical fix might be borrowing a low coffee table from the house and using a blanket and cushions for an upmarket picnic on the lawn. Buy some bright outdoor cushions to liven up tired garden furniture and create a beautiful, comfortable party space. Alternatively, harvest any soft furnishings from inside your home (throws, rugs, cushions, pillows) and scatter these around your garden to set the party scene. Read our guide to throwing a garden cocktail party for more ideas on how to quickly turn your garden into a full on entertainment zone. We hope this guide inspires you to create an outdoor entertainment area in your garden. Let us know how your project goes. And we’d love to see it – share your images with us on our Facebook page and we may feature you on our blog.